Grant Carnie, originally from Western Canada, but now calling Colorado home, joined Mark for an amazing group of climbs. While exhausting ourselves, we did a good job of decimating Grant's original "hit list". 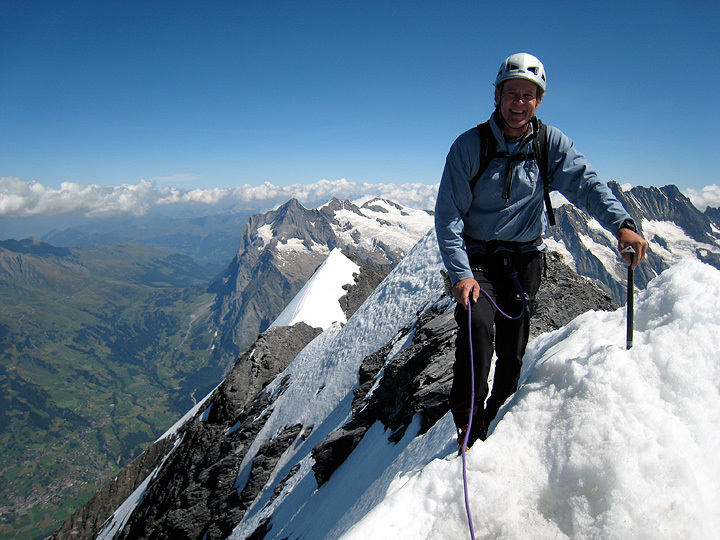 The Eiger's Mittellegi Ridge was first on the list. But, oh, no room in the hut that night. Feeling cocky, we decided to do the route in a day from town catching the first train in the morning from Grindelwald, and hoping not to miss the last in the evening back from the Jungfraujoch. Alright, I'll admit that the Miroir d'Argentine was not on the original hit list, but on the drive to Grindelwald and the Eiger, it is so close... Well why not? Anyway, with the Mittellegi hut full we needed something to amuse ourselves on the drive over from Chamonix. This is a fun route, about 15 pitches altogether. 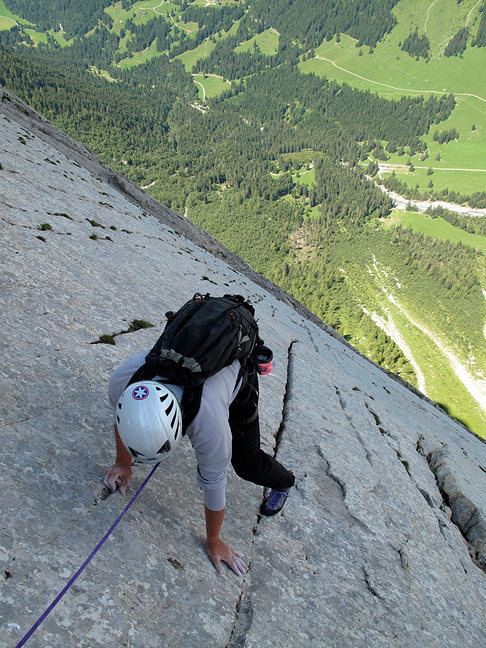 The big slab of limestone which is the Miroir. 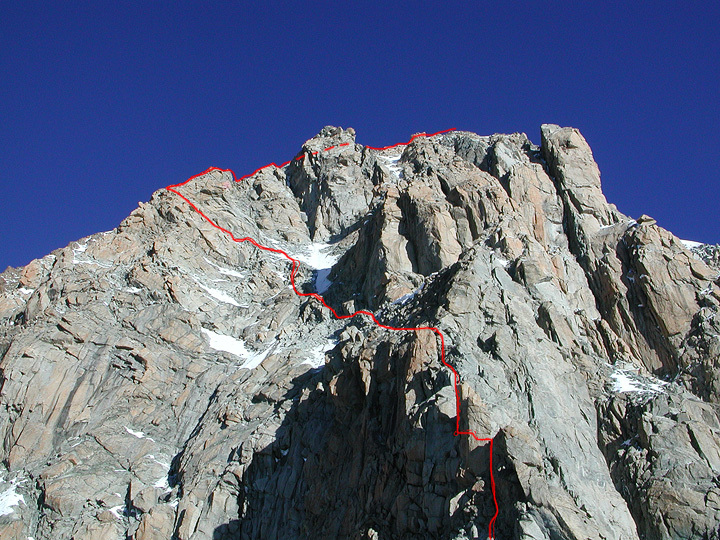 The Directe route, the one we did, shown. Catching the 7:30 train from Grindelwald as the start of a big alpine route felt odd, indeed. And once we step off the train in the Eismeer station, the strangeness continues, with a walk down an icy tunnel and then out on to the glacier. 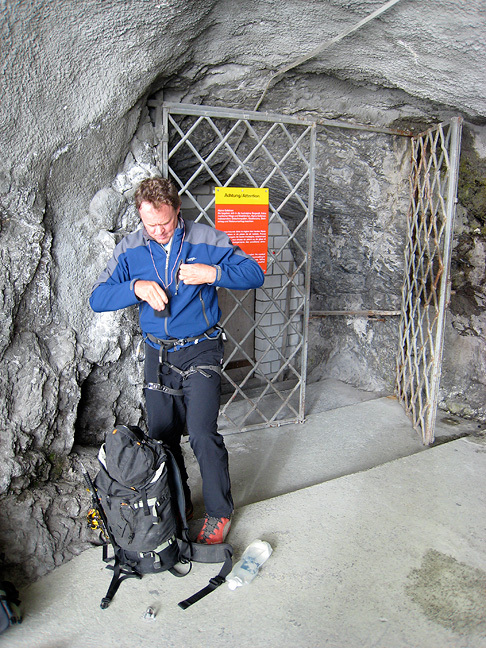 Grant prepares the kit for the exit into the alpine world. But it is a lovely day, if a bit warm. 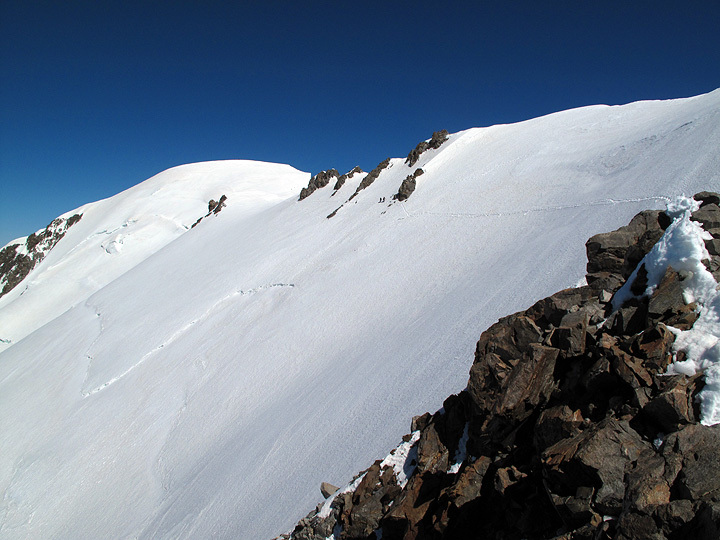 We reach the edge of the glacier and start the rock pitches that lead to easier climbing and the Mittellegi hut (which we'll bypass). 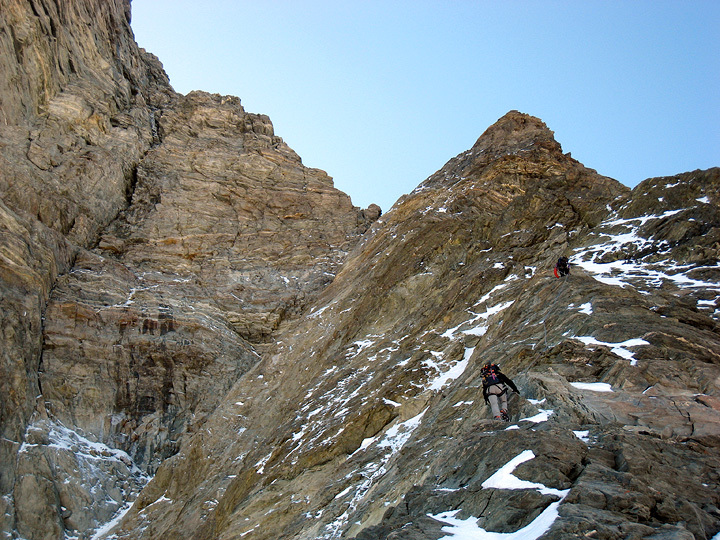 Arriving on the crest of the Mittellegi ridge after only an hour's travel. The view up the ridge ahead. Arriving on the summit, only 4 hours after stepping off the train in the Eismeer station. 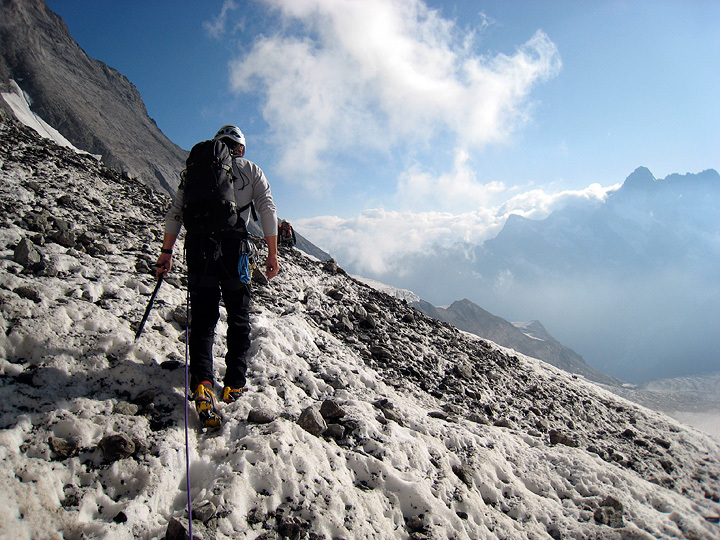 Moving right along, we have descended to the North Eigerjoch and are now, climbing the final rocks to the glacier and easier walking. The Eiger behind. 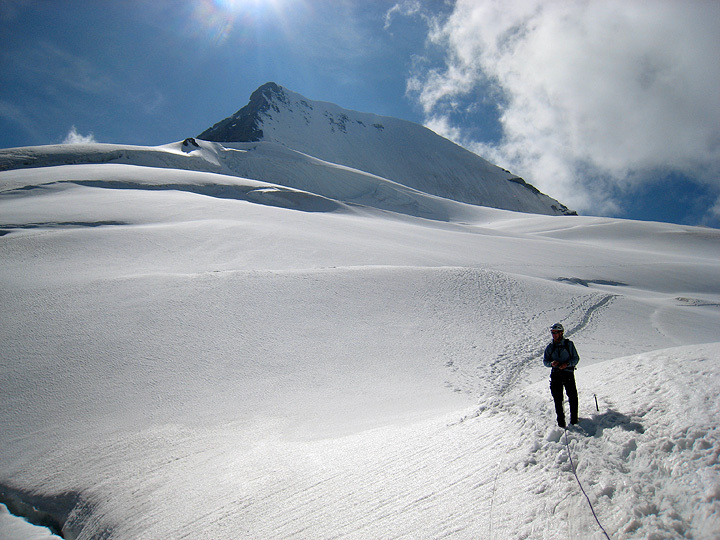 And at last the easy snow below the North Face of the Mönch. And we do indeed arrive back at the Jungfraujoch with plenty of time to spare. We'll sleep in Grindelwald tonight. 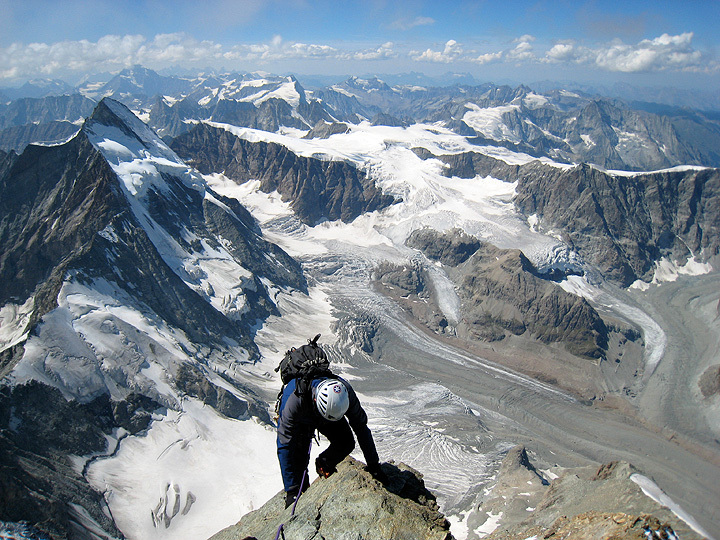 Next on the list, the Zmutt Ridge on the Matterhorn. 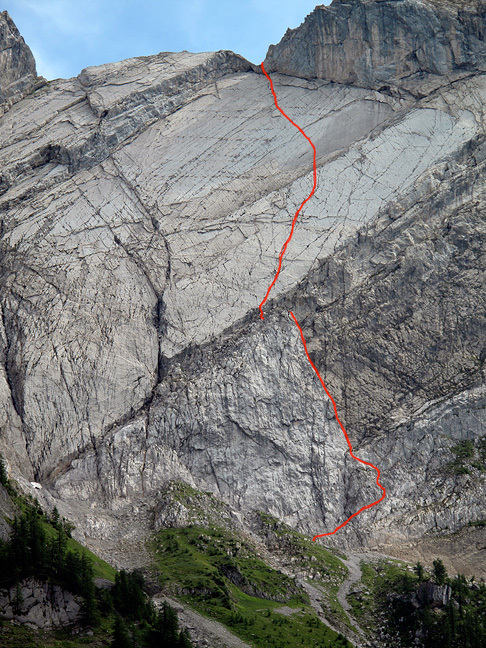 This route is seldom in condition, and to tell you the truth, it still wasn't when we climbed it. 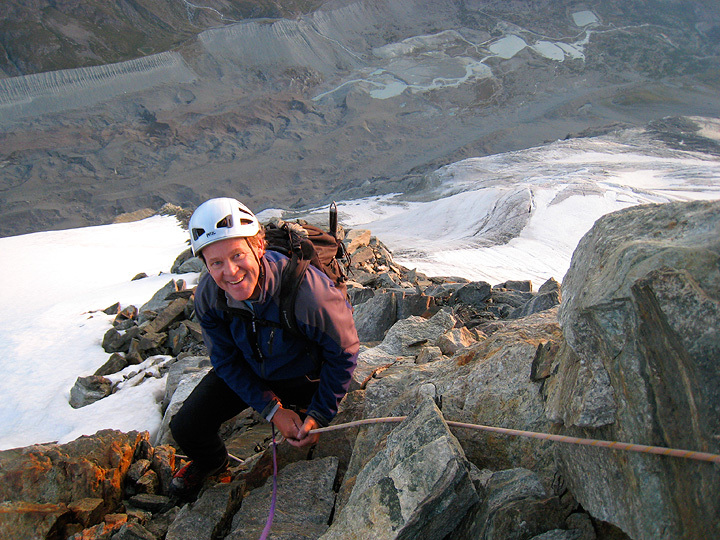 After spending a restful night in Grindelwald, we drove over to Zermatt and made the easy approach to the Hörnli hut. This photo was taken years earlier, from the Arben Bivouac across the valley. It shows the route well. There was less snow on our ascent, but still too much for easy climbing. The normal approach to the Zmutt these days is from the Hörnli hut, out of view to the left. 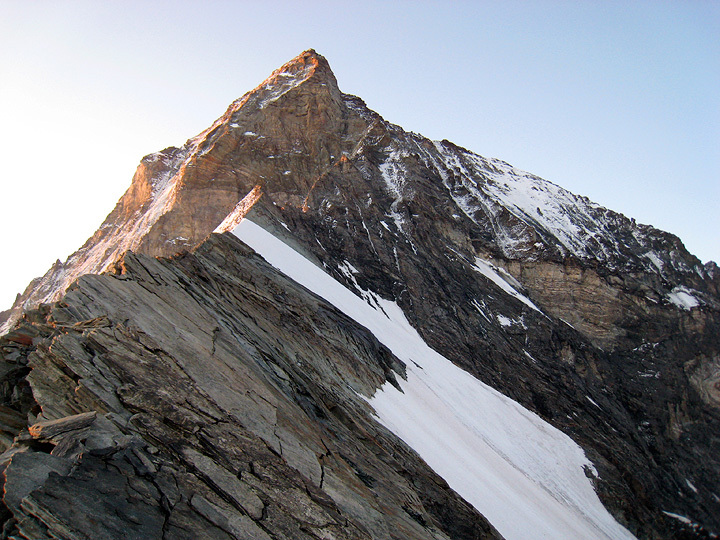 The Hörnli ridge, and our route of descent is the left skyline. 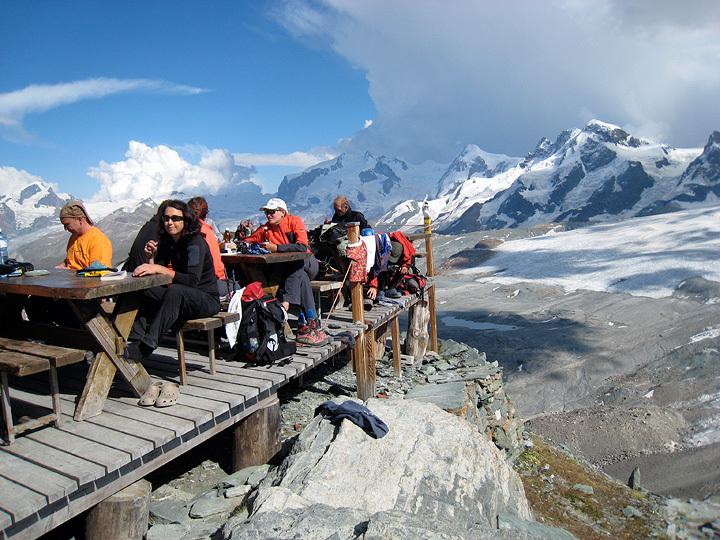 The pleasant scene at the Hörnli hut. Rising at a very early 2 am we climbed for quite a while in the dark, traversing under the Matterhorn's North Face and gaining the rotten rock rib (dropping below Grant in this photo) that leads up to the actual crest of the Zmutt Ridge. I'm not sure why this little piece of fixed rope is here, it served no useful purpose. 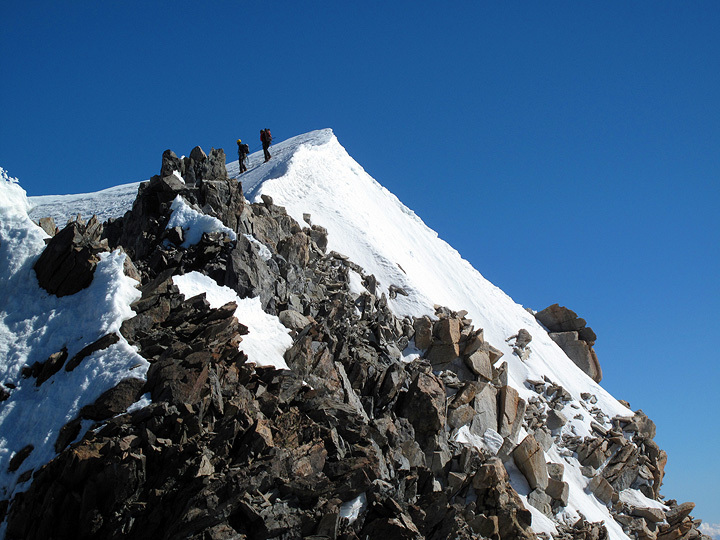 The view looking up towards the summit from the same location. The Leon (Italian) Ridge is the right skyline. 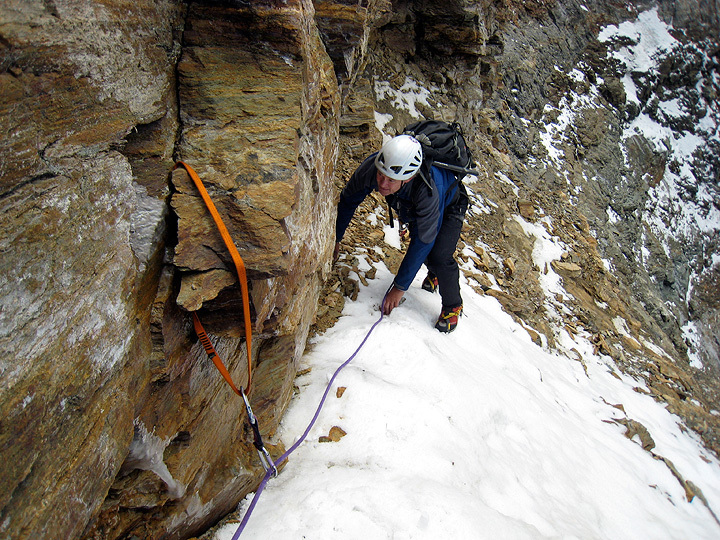 There were 2 other climbers on the route with us, Sammy, a guide from Engelberg, and Martin, a long-time client/friend. In this photo, we are looking up from a point just having passed the Zmutt Teeth, a series of pinnacles. The rock here is actually much snowier than it would appear, slowing progress greatly. We have reached the point where the route traverses onto the West Face. bits of snow and verglas again hampered progress. We are, finally, only a pitch away from where the route regains the NW Ridge, with better rock, and somewhat easier climbing. Grant is just about to arrive on the summit. 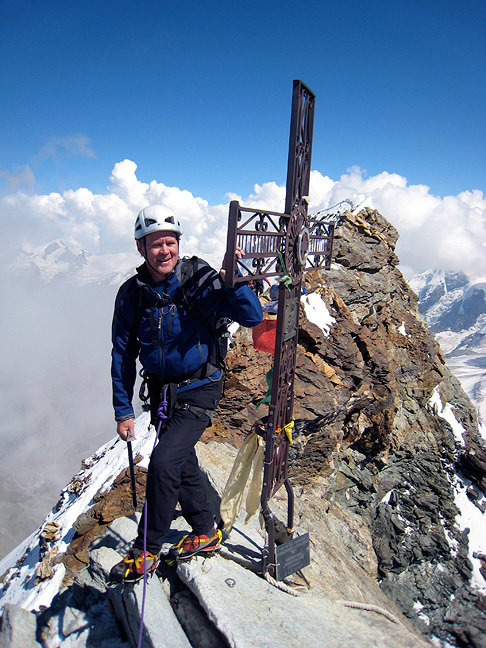 On the Italian summit of the Matterhorn. 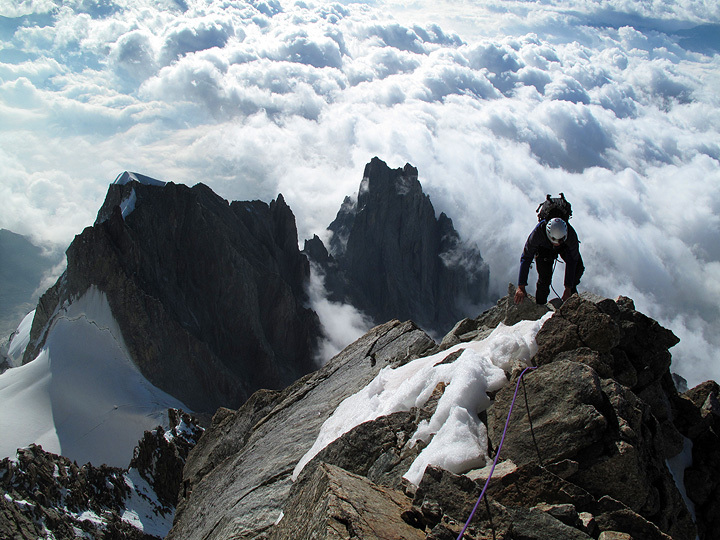 And for the last part of our "Super Trilogy" the Innominata Ridge on Mont Blanc. 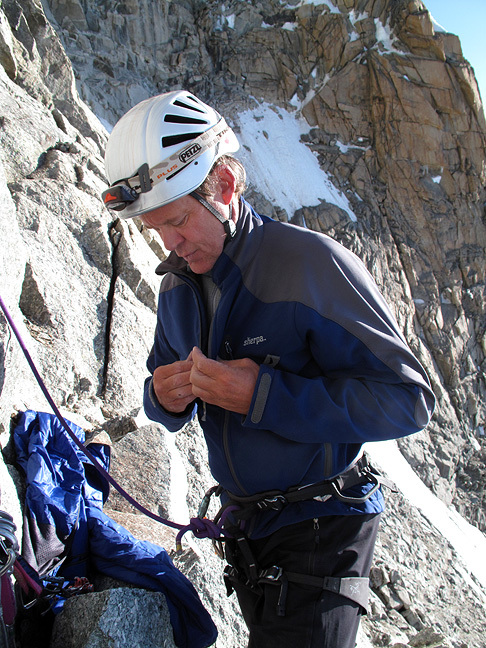 We opted for a 2-day schedule, with the first including a long (7500 foot) climb up to the Eccles bivouac hut, and the next up and over and hopefully down. 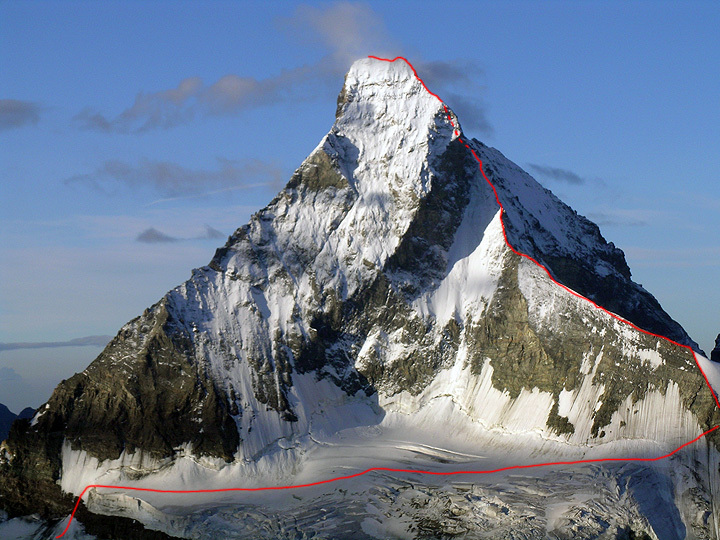 Due to a camera image downloading problem, I don't have any photos of the climb up to the hut. 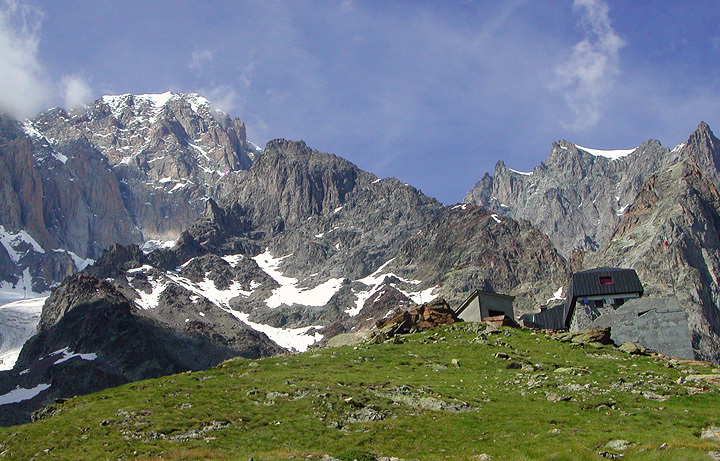 However, this one, taken some 5 years earlier, shows the Monzino hut (reached in about 2h30 from the car park) on the right, and Mont Blanc towering above on the left. This photo, also 5 years old, was taken from the summit of Point Eccles. 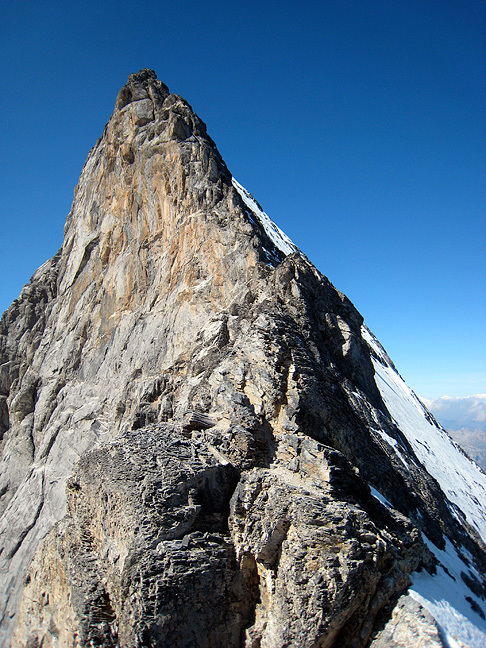 It shows some of the upper route on the peak, though the entire image is quite fore-shortened. 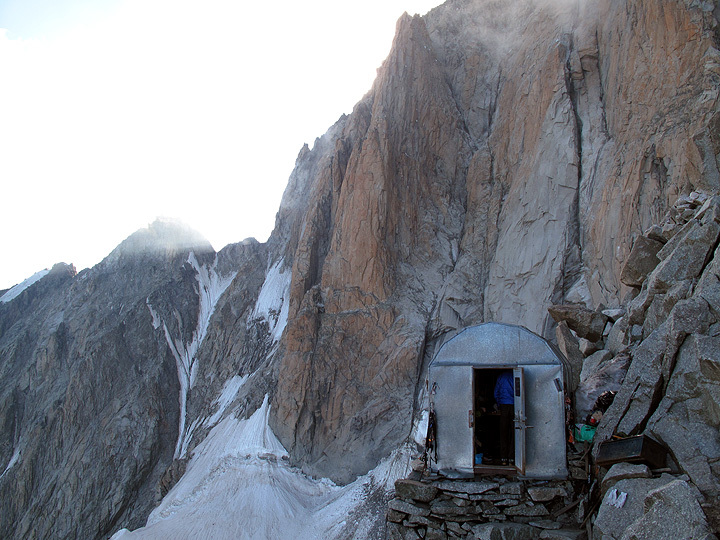 The Eccles hut. We shared the hut with a French guide and his German client (doing the Brouillard Ridge) and a Swiss guide and client pair also planning the Innominata. Starting at 3:40 in the morning, much of the route is climbed in the dark (no photos). 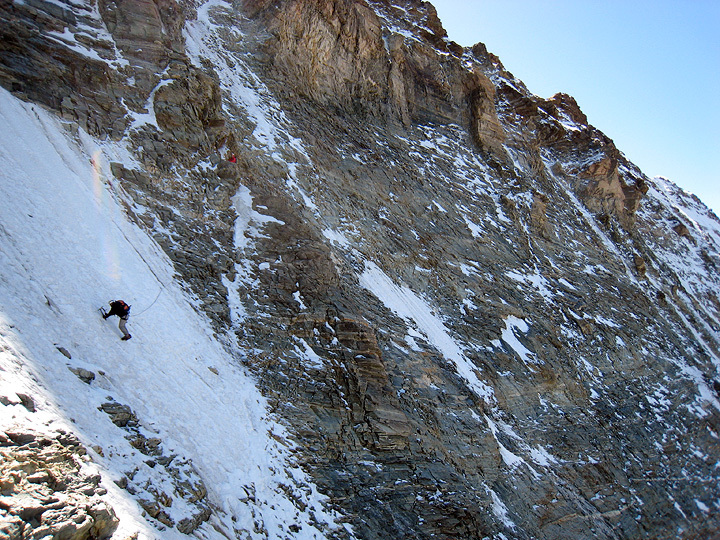 Here, we have crossed the Grand Couloir and have only a few more pitches up the ramp that leads to the upper section of the Innominata, with better rock and more enjoyable climbing. Higher still, we don't have far to go to where the Innominata intersects the Brouillard Ridge. 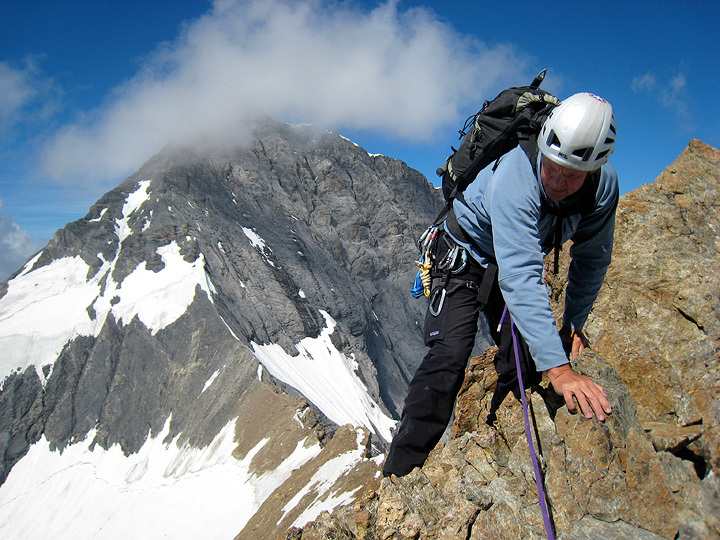 We have finally reached the Brouillard Ridge, with only easier climbing between us and the summit. The Swiss guide and client just ahead of us. Looking over towards the summit of Mont Blanc, the big dome on the left. 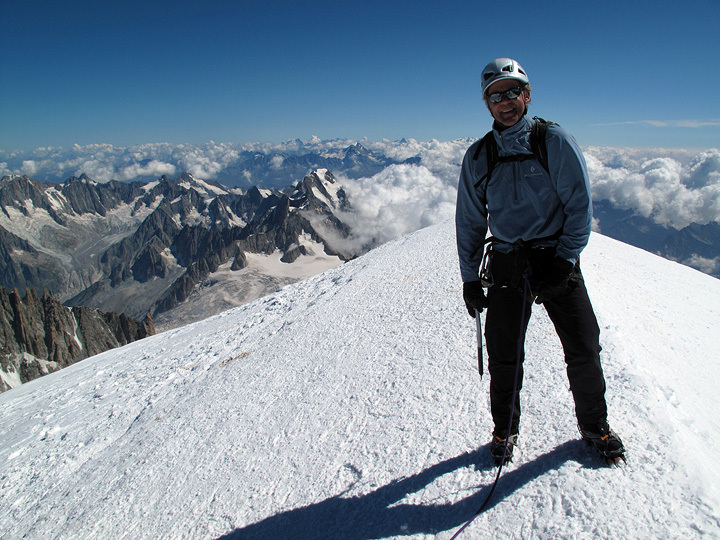 At last, on the summit of Mont Blanc! Amazingly, we had it all to ourselves. It is a long way down to the valley, however. 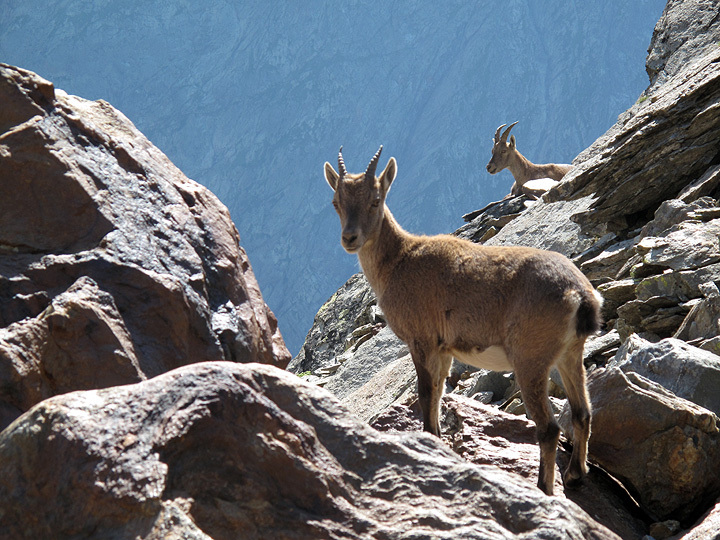 But these cute ibex offered some amusing distraction from our aching feet. 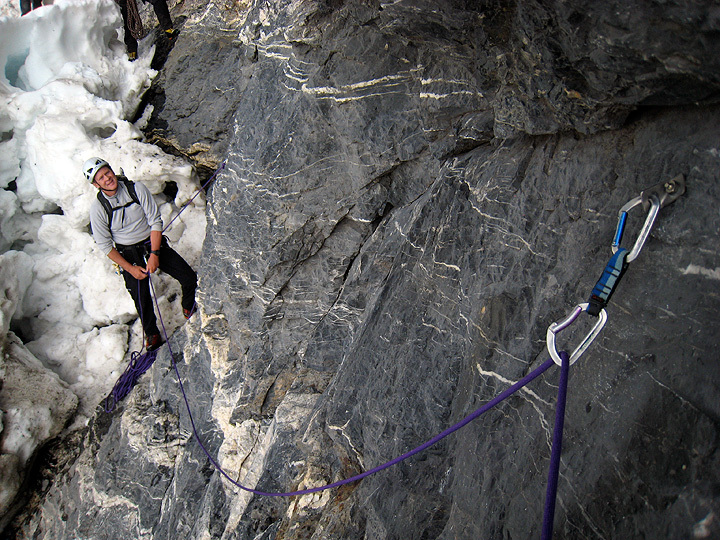 We did manage to get all the way to Chamonix that day, enjoying the pleasures of a hot shower and a soft bed.